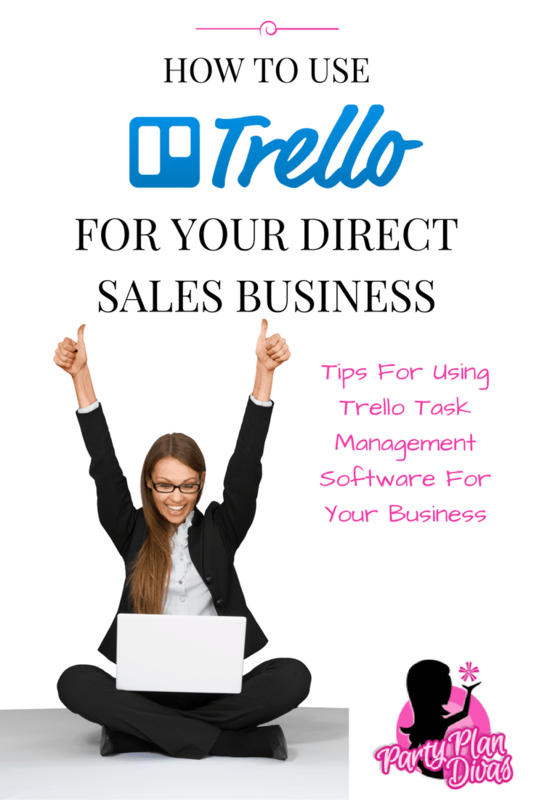 How To Use Trello For Your Direct Sales Business – And Life! Have you heard of Trello? Trello is the free, flexible, and visual way to organize anything – with anyone – anywhere!! It has literally become my “go to app” for keeping all of my tasks together in one place. Trello works on all mobile devices* plus has a desktop version as well. You can easily create To Do Lists, task out projects, set up your goals – and more! Trello is especially helpful for direct sales consultants looking to organize their businesses and manage their time. From organizing vendor events to managing team recognition and incentives, Trello can keep all of your lists in one simple place. Why should you use Trello? Trello is more than just a task management system. It’s a life management system. With Trello you can manage your direct sales business, your home life, your kids schedules, your work schedule, hobbies – literally everything – all in one place. Do you have a million things on your To Do List? Do you find yourself forgetting things sometimes simply because your list is too much to manage all in your head? The busier you get – with your business and with your life – the more difficult it becomes to manage and stay on top of your massive to do list. With Trello you can do a “brain dump” each day to put your massive to do list all down in one place – which has been proven to help you be more productive and less stressed! Once you have everything written down, you can alleviate the stress over forgetting something on the list and relax with the peace of mind that you have everything listed in Trello. I know we all try to be Super Woman… but we do not have to be. Trello makes it super easy to work together on tasks with others in real time right on the app! You can organize a vendor event with team members, create new trainings with other Leaders, share files and photos with your downline, brainstorm for new sales techniques with your colleagues – the list is endless. Or at least the effects of them. How many times have you been working on something – only to be interrupted by a phone call, email, text, or even someone dropping by? With Trello you can easily take a break to handle whatever needs to be done right then, and pick up right where you left off when you come back. OR – even better – you can put whatever the interruption is needing (i.e. call Tiffany back, get that tracking number for Angie, etc) where it belongs… on a card on Trello. That way once you have completed your original task, you have the reminder to handle the interruption so you do not forget. Trello makes managing your direct sales business a breeze. One of the ways I have begun using Trello is to manage Vendor Events! Begin by creating a Board for each event. 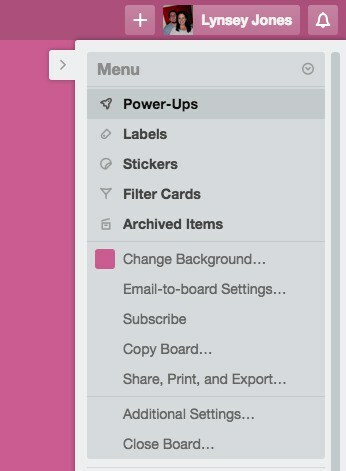 Trello Automatically puts your Boards in alphabetical order to be found easily. You can have as many boards as you would like and create new boards any time a new project comes up!! You can also group things together in Boards – like making one master board for Vendor Events. From there you can add a “List” for each event, and cards to map out the action steps to complete each task. In this example I made one Board for Vendor Events, then a List for each event I am participating in. Under each event I have “Cards” mapping out each task. Now, this is where Trello really gets exciting. Inside each card is a myriad of things that you can add – including attachments, checklists, labels, due dates – you can even share the card with other Trello members or email a direct link. 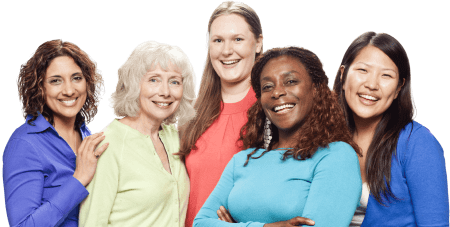 You can make a checklist for items to take, a due date to know when ordered items are set to arrive, and even attach forms that other members need – such as lead slips or vendor agreements. Anytime anything is updated on the card either by you or a member that you have shared it with, you will get a notification of the change. Trello Boards also offers additional free features that make your experience even more organized. You can change the colors of your boards, copy boards for easy duplication of tasks you do often, print boards and more. 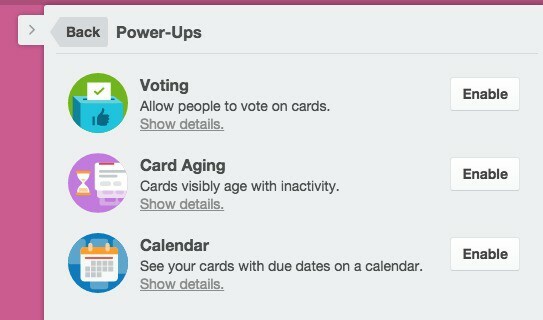 My favorite add on though are the “Power Ups” which give even more functionality and organization to your Trello boards. Be enabling the Calendar Power Up you can display cards with due dates in a weekly or monthly format for a time-based overview of cards. This is great for keeping your time management under control, and knowing exactly when things are due. Another amazing idea to use Trello is managing your team. 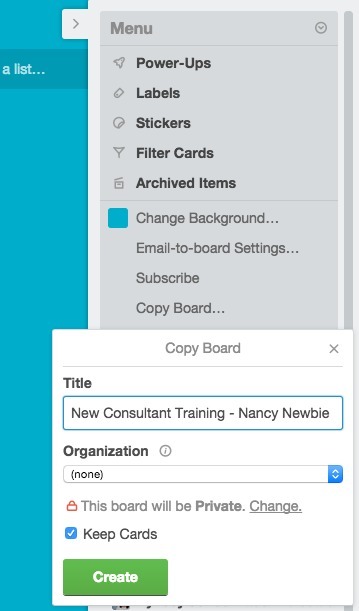 On Trello you can easily create entire training portals that help brand new Consultants learn the ropes of the business and learn where to go to find more information – right from their smartphone, tablet or computer. 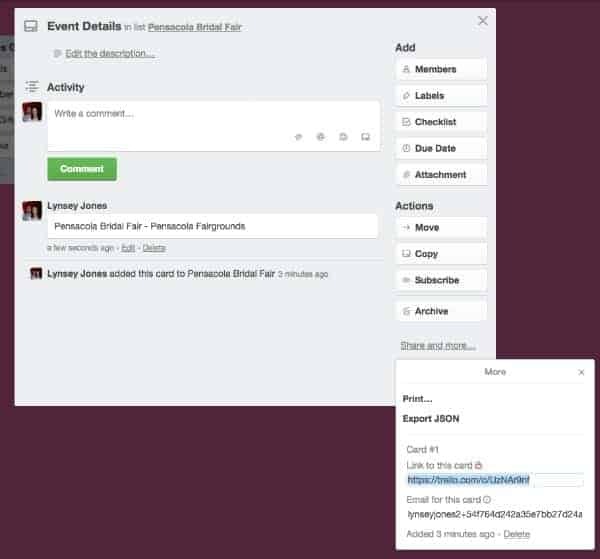 You can share this Board with Trello members that you choose and set permissions for who can add or edit content within each card. You can also set the Boards to Private so that only your team and those you invite are able to see the content. You can even upload a picture of yourself with an intro and a “Welcome to the Team” message! Cool right!? Once you have created the board just exactly the way you want it, you can easily copy it, and send it to each new Consultant, that way they have their very own board to learn from and check things off as they go. There are SO many other great things about Trello that I could not possibly fit in to one blog post, so I highly suggest you check it out for yourself and begin getting your life and your business streamlined! If you love it as much as I do, you may want to upgrade to Trello Gold which gives even more functionality as well as fun stickers and cool backgrounds to customize your boards even more!